This weapon flintlock with twelve blows was manufactured by Isaiah Jennings, which held the patent for a pistol with repetition in 1821. He was a prolific inventor who produced about fifty patents. 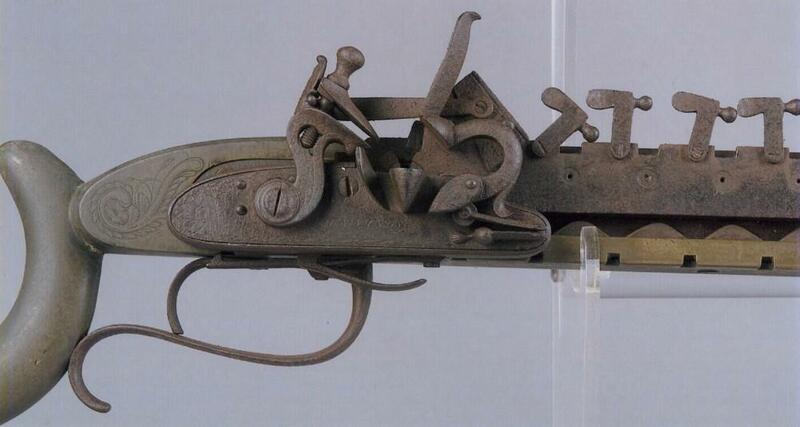 This gun is mechanically identical to a weapon patented in 1813 per Joseph Gaston Chambers, leading to the conclusion that the patent was delivered for the improvement of ammunition. According to my estimates, there probably not more than 100 rifles of this type manufactured. This one has a number one. Several are illustrated in the books, with the sticks in parquetry and of the brass barrels, drawing only three or four shots. A military version of this weapon was made on the basis of rifle common model 1819. Built with Nathan Starr and the shops of R. and J.D. Johnson for the militia of state of New York, 520 specimens with four shots, (and several with ten blows) were made under a license granted to Reuben Ellis. A development truly significant transient in the technology of the firearms. Calibre 54 rocket ball -1850.